The Akathist Hymn in Church Slavonic language. Oikos One. 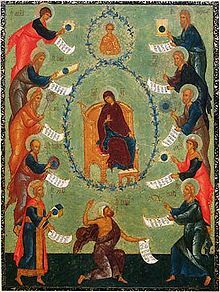 An Akathist Hymn (Greek: Ἀκάθιστος Ὕμνος, "unseated hymn") is a type of hymn usually recited by Eastern Orthodox or Eastern Catholic Christians, dedicated to a saint, holy event, or one of the persons of the Holy Trinity. The name derives from the fact that during the chanting of the hymn, or sometimes the whole service, the congregation is expected to remain standing in reverence, without sitting down (ἀ-, a-, "without, not" and κάθισις, káthisis, "sitting"), except for the aged or infirm. During Eastern Catholic and Orthodox Christian religious services in general, sitting, standing, bowing and the making of prostrations are set by an intricate set of rules, as well as individual discretion. Only during readings of the Gospel and the singing of Akathists is standing considered mandatory for all. The akathist par excellence is that written in the seventh century to the Theotokos. This kontakion was traditionally attributed to Romanos the Melodist, though recent scholarship tends to reject this authorship. It is used as part of the service of the Salutations to the Theotokos (used in the Byzantine tradition during Great Lent). It is often known by its Greek or Arabic names, Chairetismoi (Χαιρετισμοί, "Rejoicings") and Madayeh, respectively; in the Slavic tradition it is known as Akafist. This Akathist is also known by the first three words of its prooimion (preamble), Te upermacho stratego (Τῇ ὑπερμάχῳ στρατηγῷ, "To you, invincible champion"). The writing of akathists (occasionally spelled acathist) continues today as part of the general composition of an akolouthia, particularly in the Slavic tradition, although not all are widely known nor translated beyond the original language. Reader Isaac E. Lambertsen has done a large amount of translation work, including many different akathists. Most of the newer akathists are pastiche, that is, a generic form imitating the original 6th-century akathist to the Theotokos into which a particular saint's name is inserted. In the Greek, Arabic, and Russian Old Rite traditions, the only akathist permitted in formal liturgical use is the original akathist. Icon of the Akathist of the Theotokos. Fresco detail, 1644. Church of the Deposition of the Robe of the Mother of God, Moscow Kremlin. The origin of the feast is assigned by the Synaxarion to the year 626, when Constantinople, in the reign of Heraclius, was attacked by the Persians and Avars but saved through the intervention of the Most Holy Theotokos. A sudden hurricane dispersed the fleet of the enemy, casting the vessels on the shore near the Great church of the Theotokos at Blachernae, a quarter of Constantinople inside the Golden Horn. The people spent the whole night, says the account, thanking her for the unexpected deliverance. "From that time, therefore, the Church, in memory of so great and so divine a miracle, desired this day to be a feast in honour of the Mother of God ... and called it Acathistus" (Synaxarion). This origin is disputed by Sophocles (Greek Lexicon of the Roman and Byzantine Periods, s. v.) on the ground that the hymn could not have been composed in one day, while on the other hand its twenty-four oikoi contain no allusion to such an event and therefore could scarcely have been originally composed to commemorate it. Perhaps the kontakion, which might seem to be allusive, was originally composed for the celebration on the night of the victory. However the feast may have originated, the Synaxarion commemorates two other victories, under Leo III the Isaurian, and Constantine Pogonatus, similarly ascribed to the intervention of the Theotokos. No certain ascription of its authorship can be made. It has been attributed to Patriarch Sergius I of Constantinople, whose pious activities the Synaxarion commemorates in great detail. Quercius (P.G., XCII, 1333 sqq.) assigns it to George Pisida, deacon, archivist, and sacristan of Hagia Sophia whose poems find an echo both in style and in theme in the Akathist; the elegance, antithetic and balanced style, the vividness of the narrative, the flowers of poetic imagery being all very suggestive of his work. His position as sacristan would naturally suggest such a tribute to the Theotokos, as the hymn only gives more elaborately the sentiments condensed into two epigrams of Pisida found in her church at Blachernae. Quercius also argues that words, phrases, and sentences of the hymn are to be found in the poetry of Pisida. Leclercq (in Cabrol, Dictionnaire d’archéologie chrétienne et de liturgie, s.v. "Acathistus") finds nothing absolutely demonstrative in such a comparison and offers a suggestion which may possibly help to a solution of the problem. Icon of the Theotokos Orans from Spasky Cathedral in Yaroslavl (13th-century). When an akathist is chanted by itself, the Usual beginning, a series of prayers which include the Trisagion (thrice-holy) is often said as a prelude to the akathist hymn. The akathist may also be included as a part of another service, such as Matins or a Molieben. The hymn itself is divided into thirteen parts, each of which is composed of a kontakion and an oikos (Greek: οίκος, house, possibly derived from Syriac terminology). The kontakion usually ends with the exclamation: Alleluia, which is repeated by a choir in full settings or chanted by the reader in simple settings. Within the latter part of the oikos comes an anaphoric entreaty, such as Come or Rejoice. I, Thy city, ascribe Thee, O Theotokos. Detail of the icon of the Praises of the Theotokos, before which the Akathist may be chanted. The Theotokos is shown enthroned in the center, with Christ Emmanuel above her. To either side are shown the prophets who foretold the Incarnation. In the full icon, scenes from the life of the Virgin Mary surround this vignette. When the word akathist is used alone, it most commonly refers to the original hymn by this name, the 6th century Akathist to the Theotokos, attributed to St. Romanos the Melodist. It is said the Theotokos appeared to him, gave him a scroll and commanded him to eat it. And here a miracle was performed: Romanus received a beautiful, melodic voice and, simultaneously, the gift of poesy. This hymn is often split into four parts and sung at the "Salutations to the Theotokos" service on the first four Friday evenings in Great Lent; the entire Akathist is then sung on the fifth Friday evening. Traditionally it is included in the Orthros (Matins) of the Fifth Saturday of Great Lent, which for this reason is known as the "Saturday of the Akathist". In monasteries of Athonite tradition, the whole Akathist is usually inserted nightly at Compline. The four sections into which the Akathist is divided correspond to the themes of the Annunciation, Nativity, Christ, and the Theotokos herself. The hymn itself forms an alphabetical acrostic—that is, each oikos begins with a letter of the Greek alphabet, in order—and it consists of twelve long and twelve short oikoi. Each of the long oikoi include a seven-line stanza followed by six couplets employing rhyme, assonance and alliteration, beginning with the greeting Chaíre and ending with the refrain, "Rejoice, Bride without bridegroom!" (also translated as "Rejoice, thou Bride unwedded!") In the short oikoi, the seven-line stanza is followed by the refrain, Alleluia. The Salutations to the Theotokos service, often known by its Greek name, the Χαιρετισμοί/Chairetismoí (from the Χαίρε/Chaíre! so often used in the hymn), consists of Compline with the Akathist hymn inserted. It is known in Arabic as the Madayeh. The Icon of the Theotokos "Of the Akathist" is on the iconostasis of Hilandar Monastery on Mount Athos. In 1837 a fire occurred at this monastery, and the monks were chanting the Akathist Hymn in front of this icon. Though the fire caused great destruction around it the icon itself remained untouched by the flames. The feast day of the Icon of the Theotokos "Akathist-Hilandar" is celebrated on January 12 (for those churches which follow the Julian Calendar January 12 falls on January 25 of the modern Gregorian Calendar). A similar icon is venerated in the Monastery of Zographou, also on Mount Athos. The feast day of the Icon of the Theotokos "Akathist-Zographou" is celebrated on October 10 (October 23). Some material for this article taken from Akathist, an OrthodoxWiki article. G. Papagiannis, Ακάθιστος Ύμνος. Άγνωστες πτυχές ενός πολύ γνωστού κειμένου. Κριτικές και μετρικές παρατηρήσεις, σχολιασμένη βιβλιογραφία. Thessaloniki 2006.